Kelly Ripa clearly faced the same difficult question the rest of us do: With so many great, topical Halloween costume options, how do you choose just one? On Monday’s Halloween episode of Live!, Ripa pulled out all the stops and wore pretty much every costume. First, she came out dressed as Beyoncé in Lemonade, clearly a popular choice for this year. While Ripa rocked her Bey look, guest co-host Jerry O’Connell was dressed as Negan from The Walking Dead… before Ripa herself donned that costume — and a barbed wire bat, of course, to swing it at one of her co-hosting prospects: Neil Patrick Harris, Jimmi Simpson or O’Connell himself. In a nod to the epic cliffhanger on TWD, Jeffrey Dean Morgan, who plays Negan, made a brief appearance to help Ripa choose, though the camera cut away without revealing his choice. Guess we’ll find out next season. Next up was Hamilton, and Ripa’s chance to joke about her indecision when it comes to picking out a Halloween costume. Other costumes Ripa tried on during the show included Mr. Robot‘s Elliot and Harley Quinn. But easily one of her best looks was Republican presidential nominee Donald Trump. 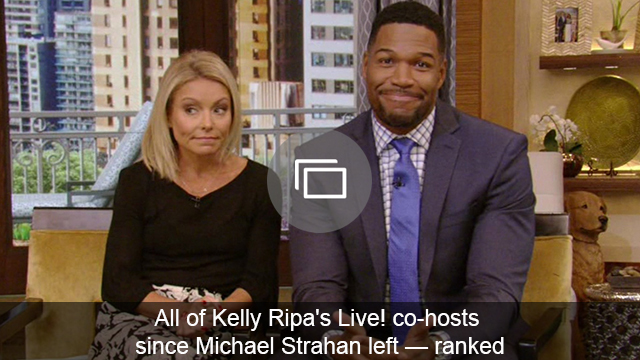 For that look, Ripa wore a bad comb-over wig, a black suit and way, way too much bronzer. More: Ashton Kutcher had a slight freak-out over Laura Prepon’s engagement on Live!